Ships from and sold by TOP-MAX Direct. CREATE NATURAL LOOKING CURLS** perfect tool for creating beachy, professional-looking curls that last all day. You can also use it as a crimping iron for hair to change up your look without any hassle. 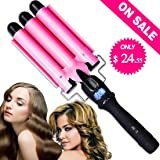 WORKS ON ALL HAIR TYPES** Whether you have short or long locks; thick or thin, this three barrel curling iron works like a charm. The heated ceramic produces negatively charged ions that create soft, shiny waves without any frizz. And unlike single barrel styling irons that take ages to curl hair, this 3 barrel curling iron does it in a matter of minutes. HEATS UP EXTRA FAST** Easily adjust the temperature to suit your hair type and cut your dressing up time significantly with our conveniently fast-heating beach hair curling iron. CURLING MADE EASY** 360 degree rotatable and tangle-free cord, non-slip handle, and insulated barrel tips to provide safety. DESIGNED FOR DURABILITY** Made of high-grade ceramic barrels coated with Teflon for superior PH resistance, this three barrel hair waver will last you through countless curling sessions. The lightweight and dual voltage curling iron (110V-220V) is also great for international travel. 1.CREATE NATURAL LOOKING CURLS** perfect tool for creating beachy, professional-looking curls that last all day. You can also use it as a crimping iron for hair to change up your look without any hassle. 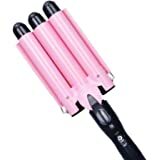 2.WORKS ON ALL HAIR TYPES** Whether you have short or long locks; thick or thin, this three barrel curling iron works like a charm. The heated ceramic produces negatively charged ions that create soft, shiny waves without any frizz. And unlike single barrel styling irons that take ages to curl hair, this 3 barrel curling iron does it in a matter of minutes. 3.HEATS UP EXTRA FAST** Easily adjust the temperature to suit your hair type and cut your dressing up time significantly with our conveniently fast-heating beach hair curling iron. 4.CURLING MADE EASY** 360 degree rotatable and tangle-free cord, non-slip handle, and insulated barrel tips to provide safety. 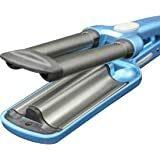 5.DESIGNED FOR DURABILITY** Made of high-grade ceramic barrels coated with Teflon for superior PH resistance, this three barrel hair waver will last you through countless curling sessions. 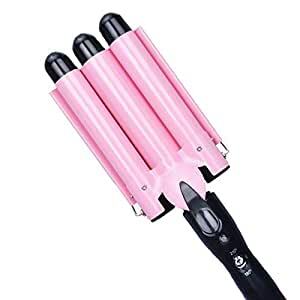 The lightweight and dual voltage curling iron (110V-220V) is also great for international travel.